FRAMINGHAM, Mass.--(BUSINESS WIRE)--May. 3, 2013-- Staples, the world’s largest office products company and second largest e-commerce company, today became the first major U.S. retailer to announce the availability of 3D printers. The Cube® 3D Printer from 3D Systems, a leading global provider of 3D content-to-print solutions, is immediately available on Staples.com for $1299.99 and will be available in a limited number of Staples stores by the end of June. The Cube® 3D Printer, ready to use right out of the box, features Wi-Fi, is compatible with Mac or Windows, and comes with 25 free 3D templates designed by professional artists, with additional templates available online. With its ultra portable design, the Cube® fits easily in the office, classroom or living room, making it the perfect 3D printing device for designers, small businesses, students and kids. 3D printing has been hailed as a revolutionary method and an efficient technology for manufacturing, allowing for the creation of shapes or objects using digital technology. 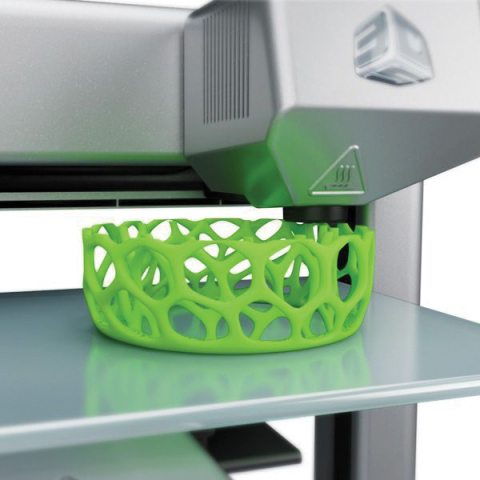 For companies creating new products, 3D printing can make it easier to design and test new concepts, and decrease the time to market. The Cube® 3D printer can print items up to 5.5" x 5.5" x 5.5”, using material cartridges in 16 different colors including metallic silver, glow in the dark and vibrant and neutral colors. Users can either print from a template or create a design using Cube’s own software, Cubify Invent™, sold separately. Staples makes printing with the Cube® easy, by offering all of the essential accessories, including recyclable ABS and compostable PLA plastic cartridge refills, replenishment CubeSticks, which are used to stabilize the object being printed, and replacement Cube Print Pads.